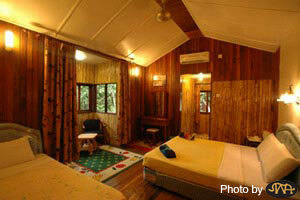 Bilit Adventure Lodge is located at Kampung Bilit, Kinabatangan River. It is about 2.5 hours drive from Sandakan Town, about 2 hours drive from Sepilok Jungle Resort or about 30 minutes drive from Gomantong Cave. Staying in one of our air conditioned room or eating in our open air dining area and listening to the sounds at night is an experience never to be forgotten. Please take a look at our Gallery and see the beauty of this lodge. We have 100% local people working fulltime at the lodge. Whatever you spend in the purchasing of any soft drinks, beers, snacks, ice creams, hiking boots and leech socks, participating in the night walk and tree planting, the benefits of which will go to the entire earning for the staff and their families. We have 16 standard air conditioned rooms and 8 standard fan rooms with attached bathroom. Hot shower and tea/coffee making facilities only available in the standard air conditioned rooms. We are pampering you with the natural surrounding and the beautiful garden around the lodge. There is no 5 star resort setting and facilities as we are located in the jungle. We will try our best to fulfill all your needs to make your stay a memorable one. Our check in time is 2.00 pm and check out time is 8 am. Mosquito is a common flying insect around the area. All our rooms are with mosquito net. Remember to close your room door all the time. There are times when you see spider web in the room, at the balcony/cafe etc, doesn't mean that we do not keep our place clean. We do clean the web without killing the small creatures in the nature; as a result the web is rebuilt within 5-10 minutes. Sometimes, you may see jungle roaches, spider, gecko, ants or other small creatures inside the room. Just let it be. Generally they are harmless. If you don't feel comfortable, please inform us and we will remove it from your room. As we are located in the jungle, you will be able to see some wildlife around the lodge. Feel free to take photos. However, we don't encourage you to feed the birds, squirrel, monkeys and even orang utan if you happen to see them. There are 3 main season at the lodge namely cicada season (Feb - Mar), green beetles season (Apr - May) and flies season (June - July) whereby during the season, you will find lots of this creatures around the dining area. Another season is the Bornean Pygmy Elephant season during Mar to Apr, June to July and Sept to Oct.
All 3 meals (breakfast, lunch & dinner) are included when you stay with us and a packed meal (picnic lunch) when you go hiking at the ox bow lake. Free flows of coffee and tea are also provided at our dining hall. You are encouraged to purchase soft drink, mineral water, alcoholic drink, snack, ice cream etc from the bar at the dining hall operated by our local staffs as all this income with go directly to them. It is safe to use filtered water for washing face and bathing at our lodge. For drinking, it is safer to drink boiled water (please do not boil the tap water) or bottled beverages. Please conserve water and do not turn on the tap whilst brushing teeth or showering. Our lodge supervisor and tour guides can speak good English. But not every staff in the lodge is able to communicate in English fluently. So when you speak to them, please bear in mind their limitations and speak slowly. There are times when they may not understand you and if this happens, you can always speak to the supervisor. We welcome you to correct us and teach us English. The single-phase voltage in Malaysia is 240 volts with a frequency at 50Hz. And the main power plug and socket used in Malaysia is the British Standard. It is a 3-rectangular-pins plug with two horizontal pins for live and neutral connections, and a larger vertical pin above these pins for an earth connection. Supply of electricity is 24 hours a day but 'blackout (power off)' is common. Bilit Adventure Lodge doesn't have a generator to go in line with our principles to keep the nature quiet and clean. A major problem with a generator is not only air pollution but also the noise disturbance that may affect the wildlife. Normally, the power will be resumed in about 1 hour. No refund will be given in this event as it is beyond our control. When you are traveling or having vacation, the best way to keep in touch with your friends and relatives abroad is by postcards. It's easy to do and cheap in price. Just buy the postcard and stamps. We will help you to post it. The most effective way to make a difference in local people's lives right here is buying drinks and snacks at our lodge. All the income from selling drinks and snacks belong to our local staffs. All the charges for the night walk, walking boots, leech socks and tree planting activities also go directly to our local guides. So you are directly benefiting and contributing to the local economy of the people in the village. The Kinabatangan River is the largest and longest river in the Malaysian state of Sabah. Originating in south west of Sabah State, the Kinabatangan River flows through eastern Sabah to the Sulu Sea on the east coast. It has a main channel length of about 560 km, a catchment area of about 16,800 km2 and covers almost 23% of the total land area of Sabah. The lower basin of the Kinabatangan River is the largest forest-covered floodplain in Malaysia, covering an area of almost 4,000 square kilometers. The river and its surrounding rainforest wetlands make up one of the richest ecosystems on the planet. The floodplain itself is a rainforest wetland, and it is the largest remaining forested floodplain in Sabah. The region is gaining increasing international fame for its biological diversity. The Kinabatangan is one of only two known places on earth where 10 primate species can be found. The most famous attraction is the "Biggest Nose of Borneo" The Proboscis Monkey, endemic only in Borneo and recognisable by the male's long, distinctive pendulous nose and a peculiar mix of colours - grey legs, white belly and tail, and an orange coat. A trip down the Kinabatangan River almost certainly guarantees you several sightings of this large yet surprisingly graceful primate, as it flings itself forcefully from tree to tree, or watches you lazily from a comfortable lofty branch. This is also one of the best areas in the world to see an abundance of wildlife in its natural habitat such as elephants, orang-utan, maroon langur (endemic to Borneo), Bornean gibbon (endemic to Borneo), snakes, crocodiles, civet cats, monitor lizards, macaques, otters and many more. It is also a haven for birdwatchers. Eco tourism plays a vital part, convincing local people that the environment is worth preserving for commercial as well as conservational reasons. That is how Bilit Adventure Lodge been designed to cater for tourists and at the same time creating more job opportunities for the local people to be part of the eco tourism plan for Kinabatangan River.